The Institute's permanent programmes make 1 Belgrave Square the main address of the Romanian culture in London, a residence of our best artists, concerts, films and books. The 'Enescu Concerts' Series, jointly organised by the Romanian Cultural Institute in London and the Enescu Society, aims to promote the music of the greatest Romanian composer to British audiences. The concerts are given by outstanding Romanian and international musicians and usually take place on the first Thursday of each month, from February to December (but not August and September) in the Institute’s chamber music hall at 1 Belgrave Square. More details about the Enescu Society in London. Every month throughout the year you are invited to watch, enjoy and discuss the best Romanian films of all times. 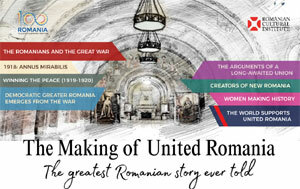 Placed under the Patronage of the Ambassador of Romania to the Court of St James's, 'At Home in Belgrave Square' is our programme that aims to protect and preserve the cultural identity of Romanian communities living in the UK (by engaging and stimulating the most creative and daring part of it). The Institute’s Library offers a variety of fiction, non-fiction and art books as well as leading Romanian publications. Immerse yourself in the Romanian literary imagination and stay tuned for the Institute’s next events!